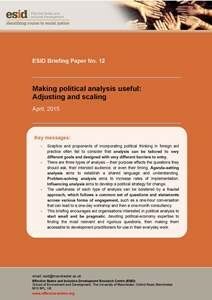 This briefing encourages aid organisations interested in political analysis to start small and be pragmatic, devoting political-economy expertise to finding the most relevant and rigorous questions, then making them accessible to development practitioners for use in their everyday work. Questions should feed into workshops and then research, not the other way around. The briefing posits three types of analysis, with three different purposes, and outlines a fractal approach, which follows a common set of questions and statements across various forms of engagement.